Onlookers can get a new view of the New NY Bridge project in Nyack’s Memorial Park. New NY Bridge fans looking for a firsthand view of construction from the Rockland shoreline now have a “front row seat” to the action. 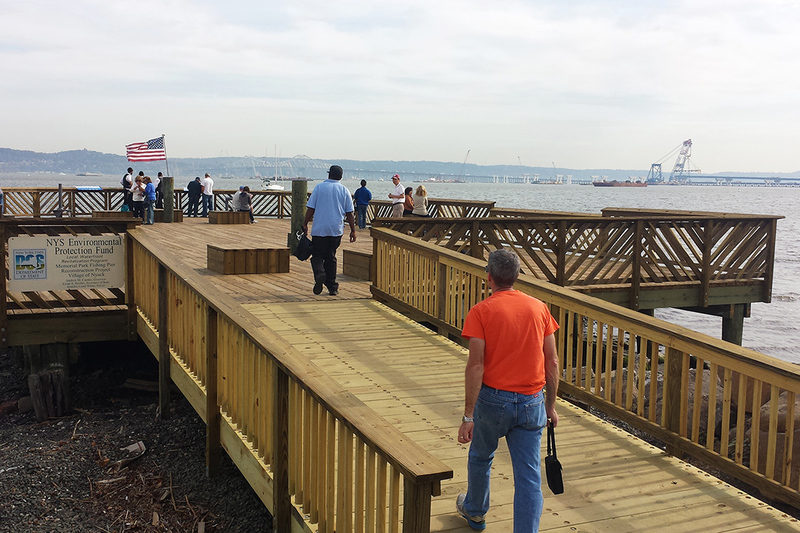 Nyack’s new fishing pier at Memorial Park is now open and offers spectators a sweeping view of the Hudson River and the bustling project site. The new viewing platform mirrors its partner across the river in Tarrytown’s Scenic Hudson RiverWalk Park. The easy-to-access platforms feature viewing scopes and informational panels, including a spotter’s guide that identifies the various types of construction equipment and vessels located on the water. A $50,000 grant from the New NY Bridge Community Benefits Program helped pay for the viewing platform signage, equipment and seating. Can’t make it in person? The project’s day-to-day progress can also be tracked from the comfort of your own home, thanks to cameras situated around the project site. Click “construction cams” on NewNYBridge.com to see panoramic and close up views. Contact the project outreach team at info@NewNYBridge.com for more information.